“ In all affairs it’s a healthy thing now and then to hang a question mark on the things you have long taken for granted”. When I came across Bertrand Russell’s quote scribbled in my one of my old notebooks, it really made me stop, drop everything I was doing and question my ungratefulness towards everything I am blessed with. Being so accustomed to our sunset, I have to be honest with you and admit that I have taken Kota Kinabalu’s sunset for granted. Ranked 6th by the Huffington Post as one of the world’s best spots to watch the sunset, we Sabahans should be proud and grateful of what we wake up to and bask in the evening to. I have a selection of places that I can go for a “makan” rave with my friends and family on the weekend. And today, instead of taking it for granted, I’d like to highlight it. Underrated by the locals, Australian Restaurant and Bar has slowly been attaining fans and food enthusiasts looking to wind down in the evening. In experimenting with food, I like to shock my taste buds with unfamiliar things. I have never tried any Sri Lankan dishes before and when I heard from the owner that it was available at the restaurant, it was music to my ears.. 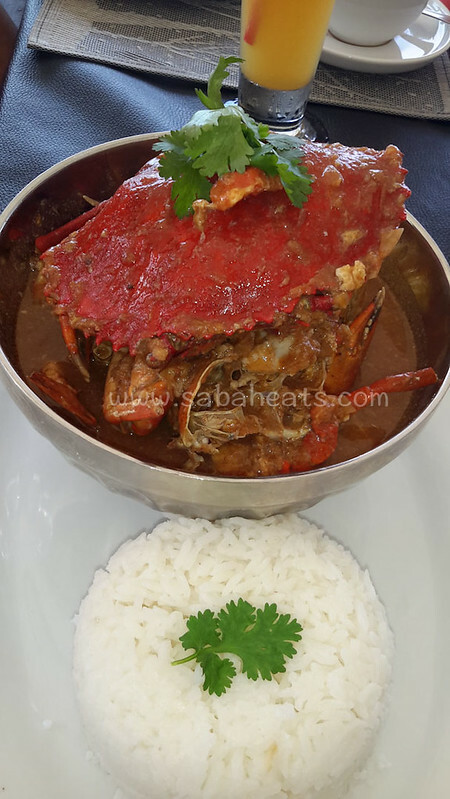 In this review, I will tell you how I discovered a Sri Lankan culinary experience with the freshest and tastiest chilli crab at our very own Waterfront. Aside from the large “Roo” sign outside of the restaurant, the decor of the Aussie Restaurant and Bar is simple with an open kitchen with a minimalist decor. These, however, I believe, are the key strengths of the restaurant because it really enables the food to really shine. Seated at the boardwalk overlooking the sea with my family all of our ‘selfies’ are Instagram moment worthy. We started with Borneo Spiced Chicken (RM 38.00), which is a deboned chicken cooked in a combination of local herbs and spices. I was expecting a dried texture of chicken when I first dived into it, but surprisingly, it was cooked for the right amount of time and it is well seasoned. By well-seasoned, I mean that the herbs and spices are just nice, not overpowering, which is a common faux-pas by many chefs. The second dish I tried is the Roasted Pork Belly Grilled with Honey Mustard and Lemon Pepper Glazed served with Apple Sauce (RM 42.00). 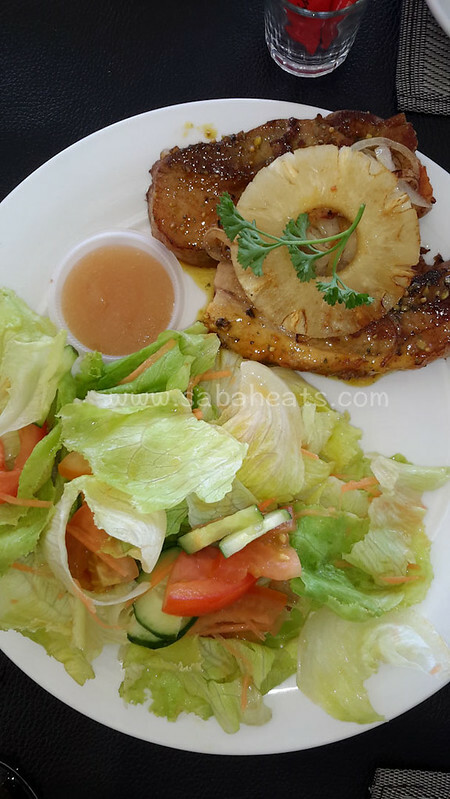 The pork belly is marinated overnight with apple cider and crushed pineapple and then slow roasted with lemon, pepper, honey and mustard glaze. 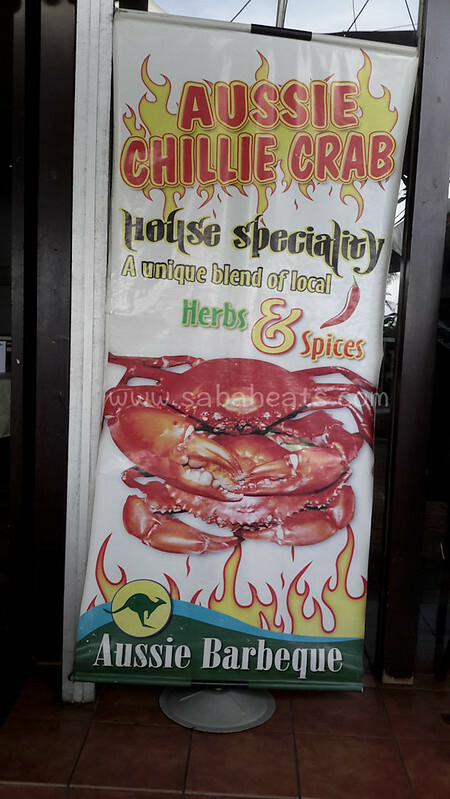 Mind you, being a ‘kampung’ Sabahan, I am used to my pork being served with a savoury sauce. So when I dipped the pork belly in the sweetness of the apple sauce, I was a little confused at how the sweetness can complement and help to bring out the taste of the meat itself. And so I was schooled. Halfway through our meal, chilli crab in a spicy sour sweet sauce was served with warm rice (or garlic bread). 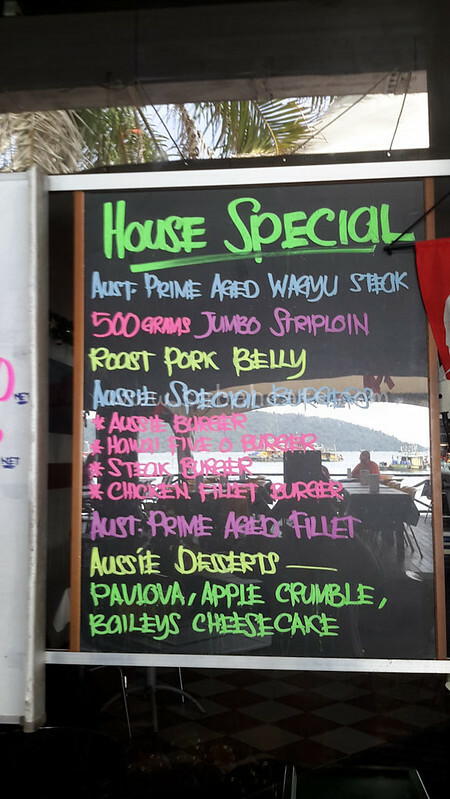 This is a chef-recommended house special and after tasting it I would personally recommend it too. The sauce was not greasy and I am still able to taste the elements of the ingredients in the dish. Crab’s freshness test 101: look at the colour of the eggs inside of the crabs, if it’s orange, its fresh. What was served on my table was “crazy neon orange”. Another great attraction of the Restaurant are the Sri Lankan Hoppers (available on Sunday from 11 am). 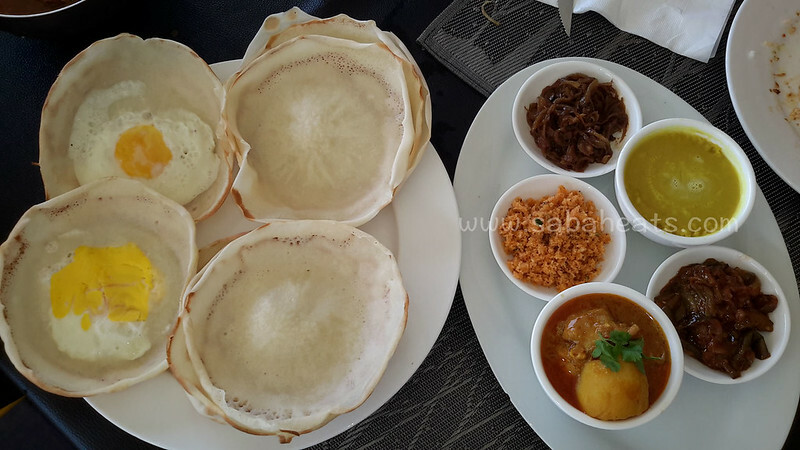 Hoppers consist of ‘Appam’, which is a pancake made with rice flour and coconut milk. It is very popular in Sri Lanka where it is commonly referred to by its Anglicised name as Hopper. 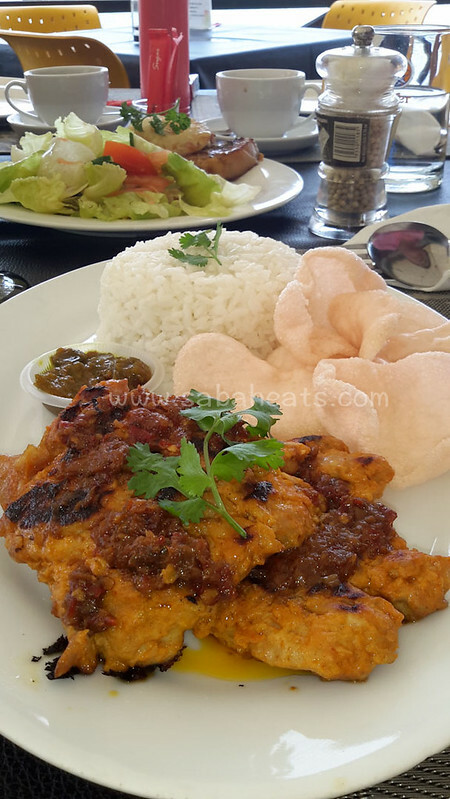 It is eaten most frequently for breakfast with an egg, or for lunch and dinner with an assortment of curries and sambals. When it arrived on the table, I was expecting a brown-like, thicker sweetmeat, like its local cousin, our very own local Apam. Sri Lankan ‘Appam’ however is thin, fairer and is more fragrant – coconut milk does the trick. If you ordered this together with your chilli crab, try to dip it in the sauce*. Priced at only RM20.00, this is a hearty meal that can be shared by two or three. Though I would love to be selfish and keep The Aussie Barbeque and Bar all to myself, the work of Mr David and Mdm Doreen-Ann is too good to stay hidden for long. Therefore, on a perfect Sunday afternoon, let us head down to Waterfront, stop the clock from ticking so fast towards Monday, try to take it real slow by not taking everything for granted and try to catch up with friends or bond with the family while experiencing that KK sunset. *Jeannette’s recommendation-(Try this at your own risk. Chemical reactions in mouth may vary). Location: The Waterfront, No 5 Jalan Tun Fuad Stephens, Kota Kinabalu, Malaysia. 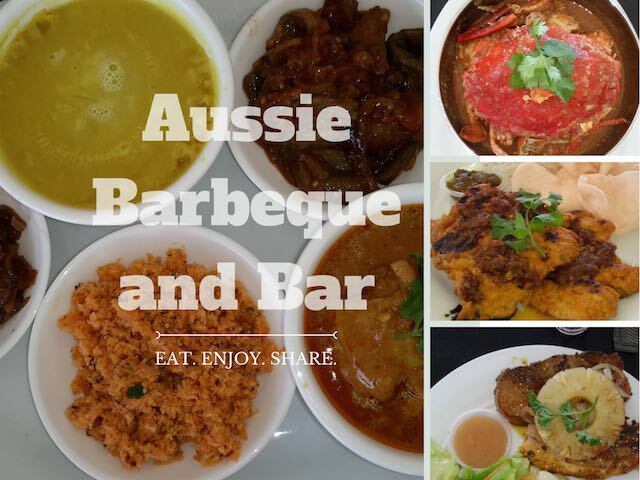 The Aussie Barbecue and Bar. 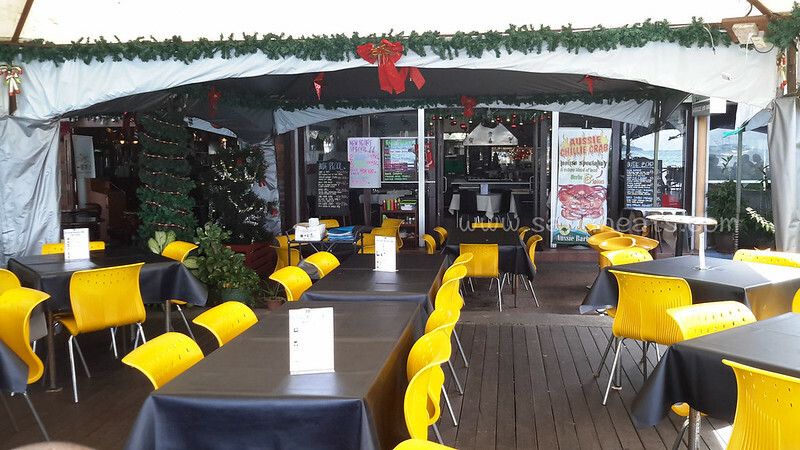 The restaurant is nestled amid the food and entertainment hubs of Waterfront, with a large Kangaroo sign that is not easy to miss when you pass by on the main road.